Description: Shimla -One of the most famous tourist destinations of India, Shimla located in Himachal Pradesh is a beautiful hill station. 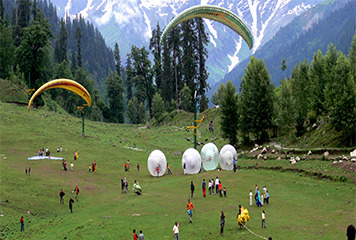 Also known as Simla, your travel to this place will be one event of your life that you shall never forget. This beautiful hill station derives its name from “Goddess Shyamla”, who is supposed to be an avatar of Goddess Kali. This lovely hill station was ‘discovered’ by the British who immediately fell in love with this place. Infact, they went to the extent of declaring Shimla as their summer capital. Meals Plan : Dinner Only Night Stay :Agra Arrive at the Delhi International Airport where you will meet our representative and Drive to Agra (220Km Approx) and check-in The Hotel. Spend the evening at leisure and stay overnight in the comfort of your hotel. Meals Plan : Breakfast and Dinner Night Stay :Delhi After breakfast, check-out from the hotel and Visit Taj Mahal, Sikandra, the amazing grave of Akbar, the Jahangir Mahal, Khas Mahal, Sheesh Mahal and Diwan-e-am. (Taj Mahal is closed on friday). later drive back to Delhi. Dinner and overnight stay at Hotel. Meals Plan : Breakfast and Dinner Night Stay :Chandigarh This morning after breakfast first you will visit old Delhi. The Raj Ghat, Red fort & Jama Masjid are important places to visit, you may also visit Chandni Chowk, spice market etc. Later on proceed to visit the New Delhi. The Qutub Minar, tallest stone tower in India, imposing India Gate and the Rastrapathi Bhawan, Laxmi Narayan Temple, Lotus Temple. By evening drive to Chandigarh (255 Km Approx). Dinner and overnight stay at hotel. Meals Plan : Breakfast and Dinner Night Stay :Shimla After break and check out from the hotel, a Visit to Rock Garden, Rose Garden and Sukhna Lake. By evening drive to Shimla (129 Km Approx). Dinner and overnight stay at hotel. Meals Plan : Breakfast and Dinner Night Stay :Shimla Enjoy early morning breakfast, leave for Day excursion to Green Valley, Indira Holiday Home, Mini Zoo, Kufri Fun Campus, Kufri, and JAKHOO TEMPLE At 2455m, this is the town's highest peak and a famous point for Shimla's famous views. The summit is crowned with a temple dedicated to Lord Hanuman. At evening your own Enjoy Mall Road, Christ Church, Lower Bazar , Lakkad Bazar etc. Come back to the hotel for dinner and Overnight in Shimla . 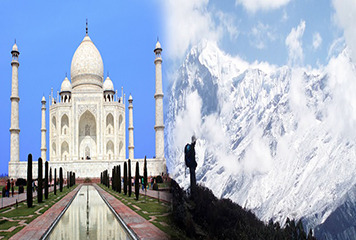 Meals Plan : Breakfast and Dinner Night Stay :Manali After Breakfast, Start for Day city tour visiting Hadimba Devi Temple, Club House, Van Vihar, Manu Temple, Vashisht Bath and Tibetan Monastery. The rest of the evening is at leisure to stroll and shop on the mall road. You may also enjoy after dinner walks on the Mall Road under a starlit sky and hearing the silence of nature. Overnight in Manali . Meals Plan : Breakfast only Night Stay :No Today morning after breakfast, check out from the hotel and proceed back to Delhi by Cab and reach Delhi at evening between 8 and 9 pm. Accommodation for 2 adults, in 1 room for 8 Nights. MAP Meal Plan - 8 Breakfasts, 8 Dinners. individual cab for sightseeing as per itinerary. Complimentary Ticket of Piccadilly cinema Manali on Last Day.